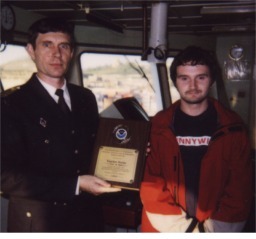 A 1999 VOS plaque was awarded to the Kapitan Konev for the high quality of weather observations. Pictured from left are Captain A. Maurer and 3/M B. Konev. Picture taken by PMO Pat Brandow in Seattle. The vessel was named after 3/M's grandfather who was a Captain for Fesco Lines in the 1920s and 1930s.